Hand Analysis - Joe Hachem makes the Worst Fold in History? Home » Poker Strategy » Hand Analysis - Joe Hachem makes the Worst Fold in History? Hand Analysis: Joe Hachem makes the Worst Fold in History? At the World Poker Tour World Championship held at the Bellagio, Joe Hachem made a very questionable fold that has sparked discussion in the poker world. The WPT World Championship is the $25,000 buy in final event of the Five Star World Poker Classic, a three-week series held at the posh Las Vegas hotel. 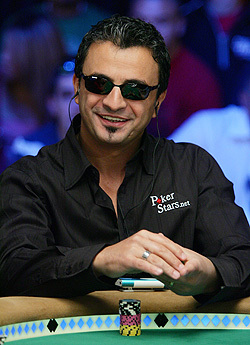 Hachem was the named the 2005 world champion after winning the Main Event at the World Series of Poker. Although he had been relatively unknown in the poker world outside his native Australia, he has enough proven success since that WSOP win to be sure that his win wasn’t a fluke. He cashed first place for over $2 million in the December 2006 Five Diamond World Poker Classic, giving him over $10 Million in lifetime winnings. In this hand, Hachem folded on the turn with the second nut straight, thinking his opponent held the nut straight. In fact, his opponent actually held top set, so Hachem was ahead, but could have been drawn out on. Good player or not, most players (good and bad) disagree with the fold. It was day 1B of the six-day tournament (there are two “day ones,” with half the field starting on each day one). In the middle of the day, with blinds at 100-200, Jordan Morgan raised to 700 and was called by three players including Hachem on the button. The A-7-4 flop was checked around. The turn was a 6, and Morgan bet 2,000. All folded to Hachem who instantly raised to 7,000 and Morgan quickly re-raised to 12,000. Hachem 4bet to 22,000 and Morgan raised an additional 27,000, which was enough to get Hachem all in if he called. He went into the tank for a few minutes before asking, “You got 8-5 kid?”. Finally, Morgan called the clock on him, thinking he had Hachem beat, and wanted to pressure him into a call. Hachem showed his cards to the rail, to explain his difficult decision at which point the tournament director informed him that if he called, he would face a twenty minute penalty for showing his cards. Hachem complained and argued with the tournament director and whilst doing so said the words “all in” which Morgan quickly jumped on asking if that was a binding action and meant Joe was committed to the bet. The tournament director ruled that it was not binding as he was talking away from the hand but the fact that Morgan questioned this gave Hachem enough evidence (in his own mind) that his opponent held 8-5, the only hand that had him beat at that point. Finally, he folded 5-3 face up, sending the crowd that had formed around the table into hysterics. On an A-7-6-4 board, the best possible hand is 8-5. The second nuts is 5-3, held by Hachem. It is true that Hachem could have been drawing dead to half the pot versus an 8-5, and if Morgan had a set of aces, sevens, sixes, or fours, he would have had ten outs to beat Hachem on the river (about a 20% chance). So what did Morgan have? Well, he opened the pot for a raise from middle position, and reports say he had been playing fairly tight. That already makes 8-5 less likely to be part of his range there, especially with both players having about 250BB stacks or more. Good players will open the pot for a raise with any two cards from late position, especially deep stacked, but Morgan was not in late position. The flop check by Morgan tells us little. He could have A-A, 7-7, or 4-4 and be slow playing. A-7 is remotely possible. An ace with a good kicker might check to gain an extra bet. A pocket pair of eights or higher most likely sticks in a bet, but with four seeing the flop, he may rightly conclude that an ace very likely has him beat. 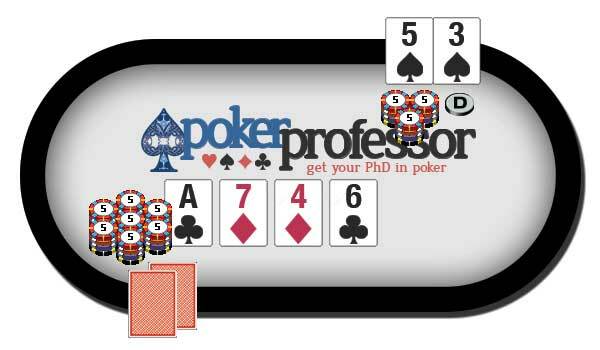 A higher pocket pair seems less likely anyway, as they are more likely to have re-raised preflop. A lower pocket pair, having missed their set, will probably be giving up, so a check is reasonable. The excellent players found in a $25,000 event are always unpredictable, so ordinary hand ranges are skewed somewhat. The turn card put a double flush draw on the board, so Morgan probably wanted to thin the field a little bit with the 2,000 bet. Hachem insta-raised, and that led to the raising war that finally found Hachem folding to the all in 5bet. Put yourself in Hachem’s shoes. You have the second nuts on the turn. You are against a tight preflop player who is highly unlikely to be holding 8-5. He has gone to war postflop with top pair hands previously at this table, so the range that he would bet all in here is certainly larger than just 8-5. You have the second nuts, and the nut hand, 8-5, is very unlikely. Even if he does have 8-5, you still have three outs for the chopped pot (not much, but some consolation). Morgan has been tight preflop, but has shown the ability to play top pair hands strongly, so this certainly widens his range. You have put less than half your stack in and will be left with about 135 BBs, still a manageable stack. There is a significant amount of time left to rebuild and wait for a better spot, despite the tough field. There is no way you have your opponent drawing dead (unless he has only one pair after the turn, very unlikely). A set, two pairs, or a flush draw has outs to beat you. Here are the equity calculations. We give Hachem 5-3, and Morgan a range including the following hands: A-A, 7-7, 6-6, 4-4, A-7, A-6, A-4, and 8-5. Clearly Morgan has some kind of hand, so we’ll give him at least two pairs (A-K with a flush draw is possible here too). Taking into account that hand range then Hachem is a 2-1 equity favourite on the turn. With about 74,000 chips in the pot, and the cost to call the all in bet being 27,000, he has almost double the odds of winning that he needs, even if you consider 8-5 as a possible holding. If you take 8-5 out of the range, Hachem becomes almost a 7-1 favourite. Morgan showed pocket aces and many of the professionals who witnessed it were claiming that Hachem may have made one of the worst folds they had seen in quite some time. Even worse, there is debate over which is worse: folding the second nuts (especially when the first nuts is unlikely), or folding the second nuts face up. In discussion afterwards, Morgan noted that Hachem had appeared to carefully consider a reraise preflop, so Joe’s quick raise on the turn led Morgan to believe that Hachem had flopped a made hand. A good made hand there would bet a set of sevens, sixes, or fours, or perhaps two pairs. With two flush draws on the board, Morgan wanted to get Joe to commit all of his chips drawing to one out (or even drawing dead). Morgan’s min-raise 3bet induced the 4bet from Hachem, and Morgan felt that Hachem was pot committed at that point, so he 5bet enough to put him all in. Morgan made good plays in this hand, thinking (reasonably) that Hachem couldn’t have a straight, but had some kind of good, but second-best, made hand. As it turned out, the WPT rabbit-hunting camera revealed that the board would have paired on the river, meaning Hachem would have lost to a full house. That doesn’t change the facts, though, and playing results-oriented poker, this can only be considered a bad fold.